Learn everything you need to get ready for tipoff. Put together a winning lineup using the 9 positions below. Just make sure you stay under the $60k salary cap. We’ve updated our fantasy basketball scoring to better reflect player performance, and partnered with the NBA to provide official DFS scoring. 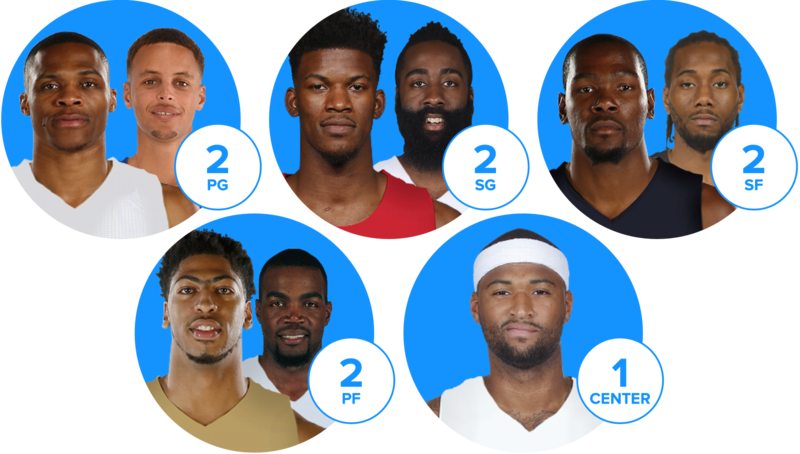 Starting 5 is the newest way to play FanDuel fantasy basketball! With 5-player rosters (G, G, F, F, C), it's just like the real game. And picking your team is easier than ever. We’ve introduced our lowest entry fees ever. Compete for cash, contest vouchers, and more — with entries fees as low as $0.05. Now, you can swap out a player anytime before his game starts. Look for the icon to find a Late Swap slate. New and improved for 2017— easily swap out a player across multiple lineups. Now, our most skilled players are excluded from all contests with an entry fee of less than $3. One game. One contest. In this new game style, you build a 5-player roster using players from only one NBA game. Scout is our NEW companion app. With Scout, you’ll get automatic injury notifications and advanced DFS research. All powered by numberFire and tailored to your FanDuel lineups. Apple and Apple logo are trademarks of Apple Inc., registered in the U.S. and other counties. App Store is a service mark of Apple Inc. Google Play is a trademark of Google Inc.
Start winning today with these simple strategies. It might sound obvious, but pick players who are going up against bad defenses. Even underperforming players can have break-out nights against a poor defense. The best way to score a lot of fantasy points... is to score a lot of real-world points. Target teams that focus on offense, and target games that are expected to be high-scoring. When a starter gets injured, his backup will usually get extra playing time and put up better stats at a lower cost. Want to get some reps in? These low-entry fee contests are a great way to start honing your skills. Friends Mode lets you play in a private league against your friends all season long. And now, you can choose which days of the week you want to play and how long your season lasts.